Recognize your special performers, and your sponsors. What better way to give recognition, than for pickup men, or judges, or grand entry members, or Queens to show off in fancy chaps? You can date them and give them to the Queen, or the sponsors. Without dates, you can keep them to use again at the next year's rodeo. You decide how you want to use your specialty chaps. God be with you, in your X-Treme Sport Advertising !!! These colors are America's most popular. Of all colors, black is still the most popular body color. Then sand or tans. And we have built purple, orange, turquoise, green, hair on, ... Trim is everybody's individuality. When specifying colors, the first color is the main body. The second is the predominant trim, and the third color is the added "Spice". Even a fourth color can be worked in. If you need some color not listed, call us. 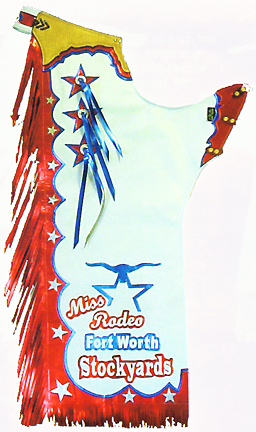 We have the availability to make your dream pair of rodeo chaps. When ordering, please refer to both the size chart and the color coding chart further down this page. However, when you are circulating Sponsor chaps, or re-using annual Queen chaps, get a good generic size that will fit most riders. Saddlebarn Chaps use quality chap leathers from the world's best leather tanneries. Keep in mind that top-grain leathers are usually stronger and more tear-resistant than suede leathers. Also remember that metallic leathers have a topcoat to create the metallic finish. This topcoat makes the leather stiffer. We recommend metallic trim, belts, or fringe, but the body will move better if top-grain leather is used, rather than a metallic body. 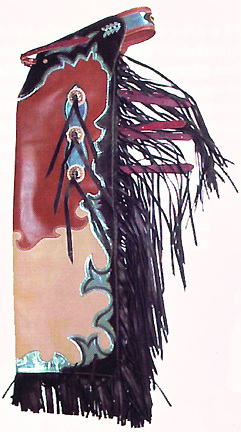 These Custom Made chaps are "custom" and are manufactured as they are ordered. This way you can pick your own colors and detail. They are not returnable, except for defects or repairs, and will be replaced ASAP. No refunds will be allowed once the Custom Chaps are in process. ALLOW PLENTY OF TIME BEFORE YOUR EVENT FOR MAKING THEM. This is not a last minute item. Cultured Cowboy will do everything possible to rush them along, but it is so much nicer if you get them 6 to 9 months early and use them to promote your event. This gives normal time for all the little approvals along the way. Sometimes, showing what another sponsor has done with chaps can spur another sponsor into a larger contribution! 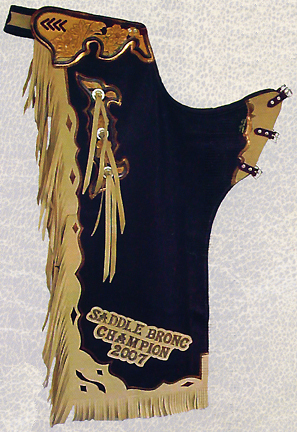 Saddle Barn Inc. Award Chaps are made with 3 to 4 oz. top grain leather bodies, handcut. Your choice of top grain and metallic trims. If fringed, the fringe is a special cut on a 45 degree angle to allow more "show" affect. The side fringe is extra long, and extra flashy. The lower leg fringe is reduced so you won't trip all over yourself. This is attached to a square bottom. Meticulous attention to detail and workmanship is obvious throughout the chaps. There are plenty of design variations. Up to four, five or even six color combinations. Let me explain further. If you see a chap and you like the thigh patch. And you like the belt on a second chap, and the trim of 2 more, all this can be combined for you. Logos can be custom made for your sponsors. We just need the artwork. Available colors in metallic include: red, royal blue, silver, green, purple, turquoise, and gold. Really, any color that top quality leather makers have available. From time to time special order metallics, such as pink and baby blue become available. Call us if you are interested in these or any other colors, and we will be glad to check on availability. The waist is adjustable by front buckle belt fastening, and the rear adjusts by changing the alignment of the holes used to make a comfortable fit easy. String ties through conchos are standard. Yes, you can replace thigh straps when worn out. (They are hand riveted with copper rivets.) That extra bottom trim is designed to hold your chap from curling, and adds just enough weight to flail your leggings as the judges are thinking about your score. Need silver initials on the belt, or think of something else we might try? Standard outseam is 42 inches. The Sponsorship chaps are made to fit most rough stock riders right out of the box. But remember to give us your measurements when you order. This way we can be sure they fit properly before we ship them. To assist you in measuring properly, visit our Custom Chap Measurement page. (Custom sizing needs may be slightly more for longer lengths.) - Ride Safe! 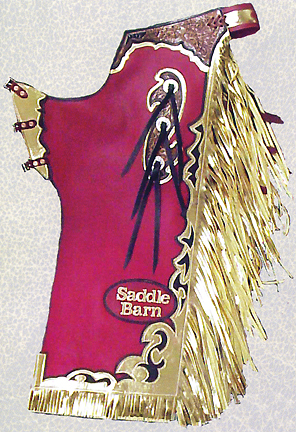 White body, Red Metallic fringe, Gold Metallic belt, Royal Metallic & Red Metallic highlights. 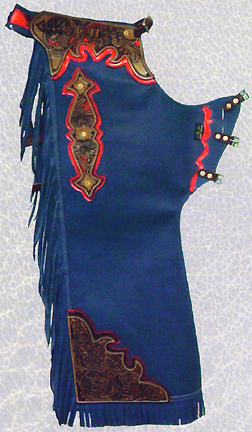 Navy body, Silver Metallic & Red Metallic fringe, Hand Tooled belt, Silver Metallic & Red Metallic highlights. to thousands of spectators, (perhaps also on TV coverage). 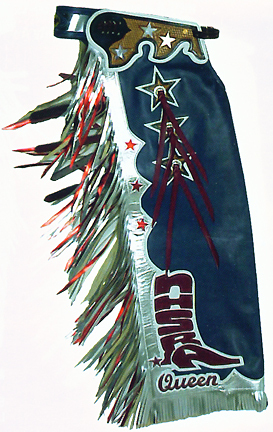 Black Body, Hand Tooled belt, Red Metallic fringe, Silver Metallic borders, Gold Metallic highlights. Dodge Rodeo is always a great Sponsorship. Local Dodge dealers will agree to advertise the Rodeo, while they advertise their car lots. They usually contribute to prize money, other rodeo officials, and more. Contact you local Dodge Truck Dealer and work together on a great program. Padded the way you want 'em! 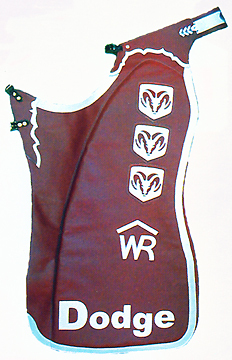 Chocolate body, No fringe, White borders, White logos & highlights, Rodeo Company Brand and Dodge Brand. 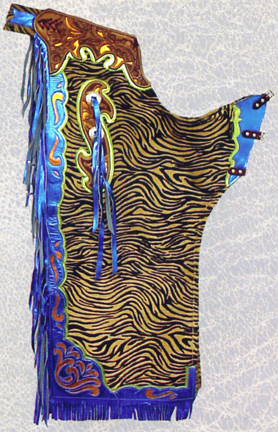 Lt Medium Brown body, Purple Metallic fringe, Black borders, Gold Metallic highlights. Any chap in this Saddle Barn Rodeo section can be special ordered as a Trophy chap, or as a Sponsorship chap. We just move things around a little and add your logos! Black body, Sand fringe, Hand Tooled belt, Copper Metallic borders & highlights. 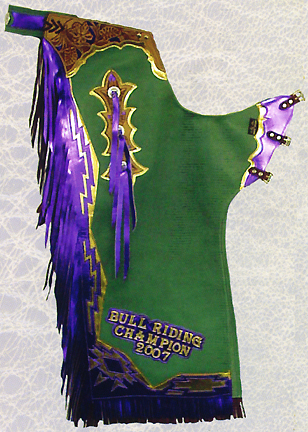 Green body, Purple Metallic fringe, Hand Tooled belt, Gold Metallic borders, Gold Metallic highlights. Drop Shadow Leather Lettering is only $6.00 per letter. 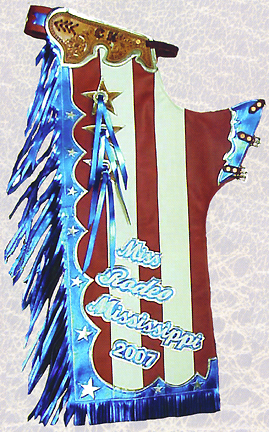 Rended Stripes Red / White body, Royal Metallic fringe, Hand Tooled Filigree belt, White borders & highlights. Wine body, Gold Metallic fringe, Hand Tooled belt, Black borders & highlights. 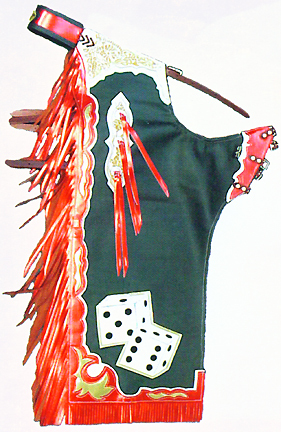 Black body, Fushia Metallic fringe, Hand Tooled Filigree belt, Green Metallic Borders, Green & Fushia Metallic highlights. 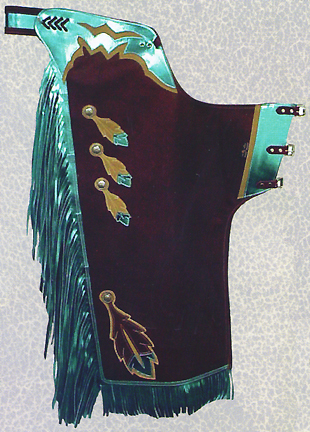 Hair on Hide body, Royal Metallic fringe, Hand Tooled Filigree belt, Lime Green Metallic Borders, Copper Metallic highlights. Lettering and logos tooled in, or cut out, for you. 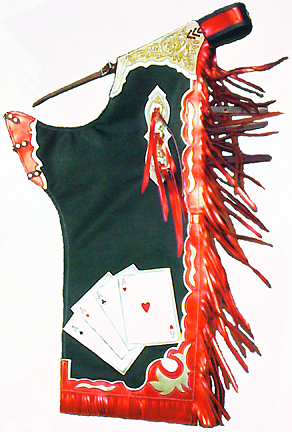 Royal body, Royal fringe, Hand Tooled Filigree belt & Thigh, Red Metallic Borders, Hand Tooled highlights. Chocolate body, Teal Metallic fringe, Tan Borders, Tan & Teal Metallic highlights. This is a listing of common colors. Click the COLOR CODING CHART to see the actual colors. The most Popular Metallic colors seem to be Red, Gold, Silver, Turquoise, Green, and Purple. Call us about other colors that interest you. 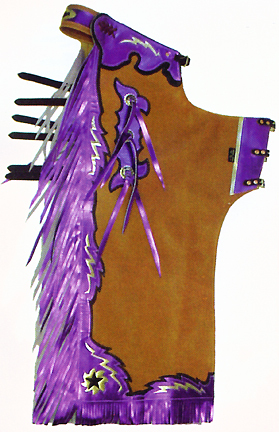 If the leather is being made, we can make it into a pair of rodeo chaps for you. Standard outseam is 42 inches. The Sponsorship chaps are made to fit most rough stock riders right out of the box. But remember to give us your measurements when you order. This way we can be sure they fit properly before we ship them. To assist you in measuring properly, visit our Custom Chap Measurement page. (Custom sizing needs may be slightly more.) - Ride Safe! STANDARD WAIST 30" Adjustable 39"